Free games: Win a Steam key for strategic multiplayer arena battler The Maestros! The leafy animals that populate the forests in The Maestros are cute and all but do you know what’s better? Battle bots. Yep, little machine minions that follow you around and help you fight your enemy as you head towards victory. If you have any qualms with killing innocent creatures then you’re going to want to leave that behind while playing The Maestros. It’s a team vs. team action-strategy game that is due to have a closed multiplayer beta test this weekend. We want to make sure you can be part of it – that’s why we’re giving away 1,250 Steam keys for the game below. After more freebies? Here are the best free PC games. Before we get to that, though, some information on this closed beta test. It will be available from Friday, May 25 at 14:00 PT until Sunday, May 27 at 18:00 PT. You’ll be able to play The Maestros online through Steam during those set hours as well as play it offline with bots and a tutorial outside of the beta test hours. Got that? Good. As is explained in the handy video below, the idea in each match of The Maestros is to deplete all of your enemy’s respawns – you do this by killing their player-controlled commanders, of course. 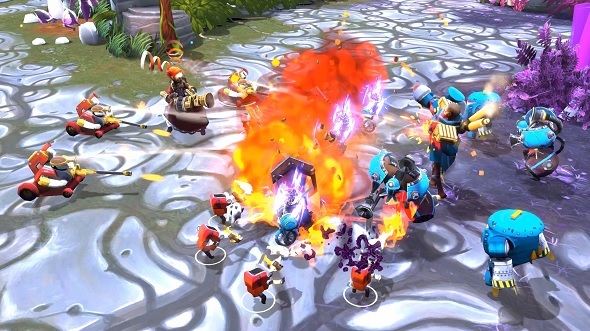 However, similar to a MOBA, rather than have a 1v1 fight you can kill some animals and turn them into robot minions. These can be upgraded into tougher or more damaging units with a range of different abilities. Once you have your little army of robots you are then ready for some conflict. You stand an even better if you can grab a teammate and double team an opponent. You’ll want to get lots of practice in to get good at The Maestros and start winning matches. Best to get in there early, then – speaking of which, lets get you entered into our giveaway. All you have to do to be in with a chance of winning a code is use the widget below.